Richmond ParkEast Sheen Carpark, Sheen Gate, London, SW148BJ. Our Run Richmond Park race series is back and will be running on a regular basis over the course of 2019. They will take you around the superb parkland. There’s a few hills but they make it more fun! There's the option of 5k or 10k. Super fun, friendly and beautiful surroundings! Encourage friends, family or work colleagues to join you as places are limited and these events sell out quickly. Registration will be open from 8.30am and will close at 9.50am so please arrive nice and early. Parking is available onsite but please note the carpark does get full quickly so plan your journey to arrive with plenty of time to spare. Bag storage is available but please note space is limited so travel as lightly as possible. Race information will be sent by email pre-event and this will tell you what your race number is so you know where to queue on the day of the event. You will be able to view all your race details and race number by logging in to your Fix Events profile. You will be using our disposable race chips as show below. Please make sure you put this on before the start of the event. 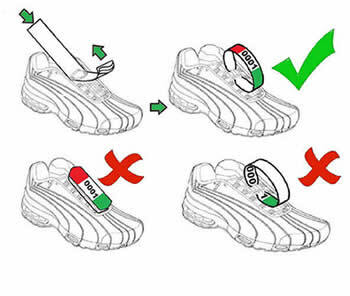 They must be looped through your shoelace with the number facing upwards. 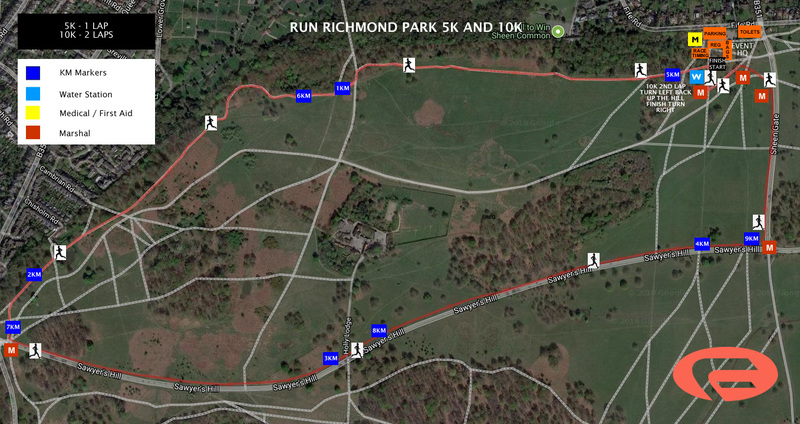 The run will take you up and around Richmond Park and the course is a mix of country paths, a little bit of cross country and as you may have guessed slightly undulating! Remember its all good fun and you can walk, jog or run!! Please note the course may be altered prior to the event and if so we will inform you of this. 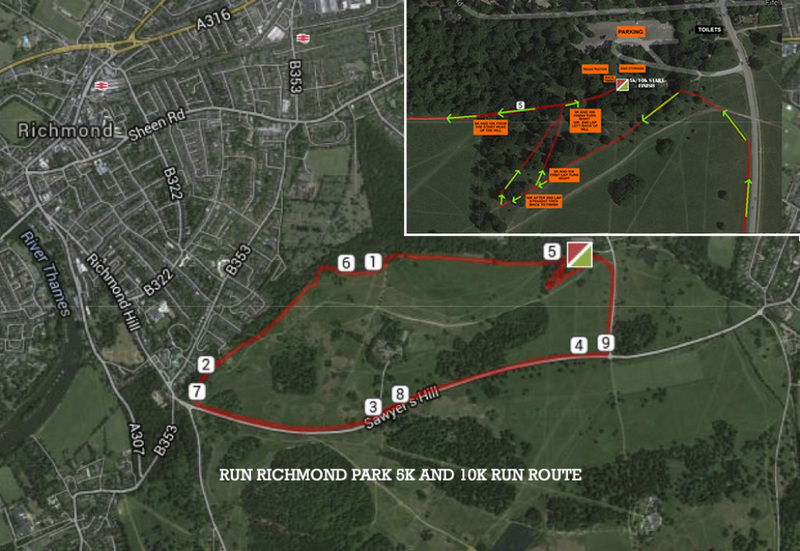 Please note that the start of the run will be staggered to abide by Richmond Park Policy. However this will not affect your time as our Results Base timing system will record your time from when you cross the starting mat. Check out a live view of the 5k run via our garmin download. Check out a live view of the 10k run via our garmin download. Water is available at the start/finish and at the 5km point. If you require additional fluid between these points please bring your own. Please take care when running around the course as this is public land and local residents will be on the Park. Please always stay on the left unless otherwise guided. Be aware that there are deer in the Park and they occasionally cross the walking paths and roads. Results go live as the event is taking place and can be viewed at the Results Base timing tent when you cross the finish line, however these also go live to The Fix Events website. Every runner receives a medal at the finish line and trophies are up for grabs for the overall winners of the 5k and 10k runs. Water is available once you cross the finish line. Sweets will be available at the finish line along with any additional products that may be supplied by any of our event partners. Trains either come in to Richmond and from there it's a 20-30 minute walk otherwise Mortlake is the closest station and about a 10 minute walk from Sheen. Entries close on the 26th June, 2019. Event prices exclude 10% booking fee. East Sheen Carpark, Sheen Gate, London, SW148BJ.